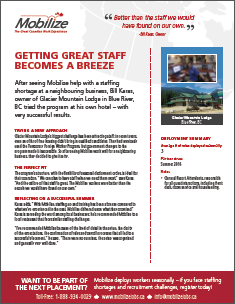 After seeing Mobilize help with a staffing shortage at a neighbouring business, Bill Karas, owner of Glacier Mountain Lodge in Blue River, BC tried the program at his own hotel – with very successful results. 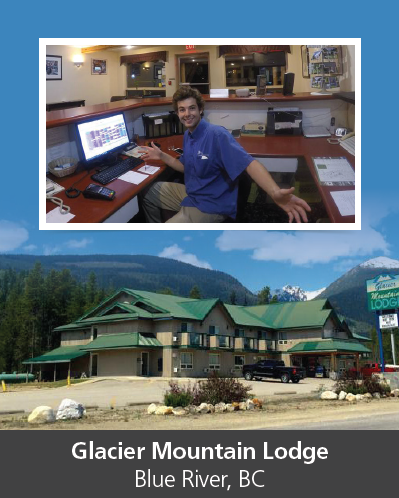 Glacier Mountain Lodge’s biggest challenge has been attracting staff; in recent years, even an offer of free housing didn’t bring in qualified candidates. They had previously used the Temporary Foreign Worker Program, but government changes to the program made it inaccessible. So after seeing Mobilize work well for a neighbouring business, they decided to give it a try. Roles: General Resort Attendants, responsible for all guest interactions, including front desk, room service and housekeeping. Karas adds, “With Mobilize, staffing up and training has been a breeze compared to what we’ve experienced in the past. Mobilize delivered upon what they promised.” Karas is spreading the word among local businesses; he’s recommended Mobilize to a local restaurant that faces similar staffing challenges.